Ever since I wrote my first blogpost and demo about using the accelerometer I've been planning on implementing some educational material that would use it. I think it can be used to make educational assignments more engaging. I finally found the time to complete the binary search tree search assignment that uses the accelerometer. Go ahead and view the demo and then come back and read the rest. This is still early work, but the version 0.2 of the library has just been released. At the moment, the library supports only array data structure and animation effects on that. Building the library is part of my research project on mobile algorithm visualization as well as the larger OpenDSA project. OpenDSA project aims at collaboratively create an active electronic book covering the whole data structures and algorithms course. The OpenDSA work has been started by creating a somewhat complete chapter on shellsort. For the next version, we have planned to add support for creating interactive exercises. The exercises will support visualizations of algorithms with stop-and-think questions about the content. Another exercise type will be exercises similar to those in TRAKLA2 where user interacts with the visualization to mimic the behavior of an algorithm. 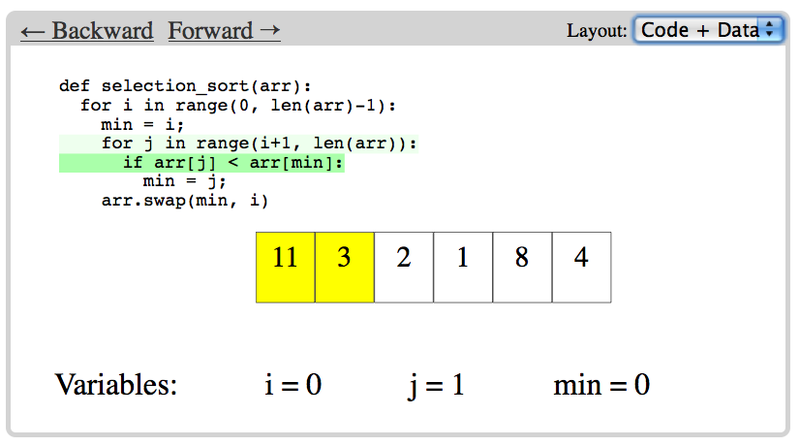 Feedback of correctness as well as model answer as algorithm visualization will also be supported. If you're interested in contributing to JSAV (and we sure could use the help) or just want to follow the development, head over to the JSAV GitHub repository. Alternatively, you can join the discussions on AlgoViz.org forums. In this paper, we present a taxonomy of algorithm animation languages that augments Price's well-known taxonomy of software visualization. Whereas Price's taxonomy is directed to classifying features and characteristics of visualization systems, the new taxonomy focuses on evaluating current animation languages. The taxonomy can be used by algorithm visualization system designers as a tool to compare visualization system languages with each other as well as for designing and implementing new systems and language features. In addition, the taxonomy provides guidelines to the features that are needed for transferring animations between systems. This is an ongoing project that elaborates upon the work reported on in a briefer version of the taxonomy. The category Visualization describes the features of the language used to create static visualizations for describing one state in the animation. In essence, it considers the variety of supported object types, that is, the building blocks used in the animation as well as ways to position and style the objects. The category Dynamics describes the level and versatility of animation effects available in the language and how the final animation can be customized through the language. These are the ways the visualizations can be changed when moving from state to state. The category User Interaction describes the type and level of interaction provided for the end-user of animations that can be specified using the language. The category MetaLanguage describes the support of features that are not directly related to algorithm animation but instead are useful in the animation creation process. These are features that are not directly visible to the end user. The figure below shows the two highest levels of the taxonomy. The paper also includes an evaluation of many of the existing AA languages. So, go read it and let me know what you think! 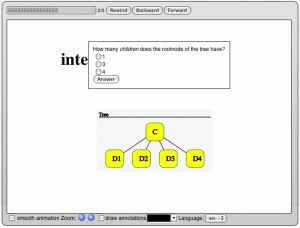 Interactive questions in algorithm animations are questions shown to the student. Typically, the questions require students to predict what is going to happen in the following steps of the animation based on the current state and the algorithm in question. The main motivation behind the questions is the belief that the more engaging the animations are, the better the learning results (see Engagement Taxonomy, especially level Responding). For this reason, interactive questions have been used in many visualization systems, such as Animal, JHAVÉ, Jeliot, and ViLLE. In 2000, an experiment comparing levels viewing and responding was conducted by Jarc et al. The results of the survey found no statistically signiﬁcant differences. However, the data indicated that the students working on level responding scored better on difficult topics, but poorly overall. The study used the Interactive Data Structure Visualizations system to visualize the data structures. Grissom et al. experimented in 2003 to compare levels no viewing, viewing, and responding using JHAVÉ system. The results show that learning improves as the level of student engagement increases. The difference between no viewing and responding was statistically significant. A recent study in 2009 by Taylor et al. compared students using passive and predictive animations of graph algorithms. They conclude that students working on the responding level learned better than students viewing passive animations. It is unclear, though, whether or not their results were statistically significant. The roots of XAAL come from the ITiCSE 2005 working group "Development of XML-based Tools to Support User Interaction with Algorithm Visualizations" (see also the Working Group report). The working group specified and gave examples for different parts of an XML-based algorithm animation language. One of the parts that was specified in detail were the interactive questions. Thus. those specifications have been adopted in XAAL. Below are examples and explanations of the different question types supported by XAAL (the working group report specifies more), see the documentation for the XAAL XML schema for interaction for details. When an animation with interactive questions is viewed in JSXaal, the questions are shown to the user. The user will also get feedback on whether or not her answers were correct. The figure below shows an example question in JSXaal. You can also view an example online. Currently, JSXaal supports questions of type select-one and select. questionAnswered(question): This function is called whenever a student answers a question. It gets as a parameter the question as an instance of JSXaal.Question. annotationAdded(annotation): This function is called whenever a students adds an annotation to the animation. What you do with the annotation and question is completely up to you. One possible way is to store the complete XAAL animation on the server, as the question response and the annotation are added to the current animation. First of all, make sure to check the brief introduction to XAAL. Then follow the three simple steps below. The directory that you just checked out includes an example in doc/example.html (imaginative naming, don't you think?). You can also view the example online. What you should see when opening that file is something like the image below. The controls for the animation should be quite self-evident: forward moves you forward and backward one step backward. The example loads the XAAL file doc/example.xml. Try modifying it by, for example, changing the positions or colors of the objects. You can also add new objects or animation effects according to the XAAL specification. Note, that the viewer does not support the whole specification yet. Publications - There are already several publications available about XAAL. These are all listed on xaal.org. Documentation - Documentation is something I'm working on improving. At the moment, the site includes some examples on how to use XAAL. 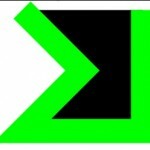 Schemas - The XML Schemas for XAAL are available from the site. The documentation for these is also work in progress. Now that you all non-existing readers of this blog :) know what is available from the site, it's a good time to explain why you should (or shouldn't) visit the site. In short, XAAL (eXtensible Algorithm Animation Language) is an algorithm animation language designed to be used in multiple algorithm animation (AA) systems. The goal is to unify the AA world by allowing interchange of animations between the existing systems. The language has primitives for working with graphics such as rectangles and circles, as well as data structures like arrays and graphs. The following is an example of using graphical primitives in XAAL. Data structures available include array, graph, list, tree, and binary tree. Below is an example of a graph. 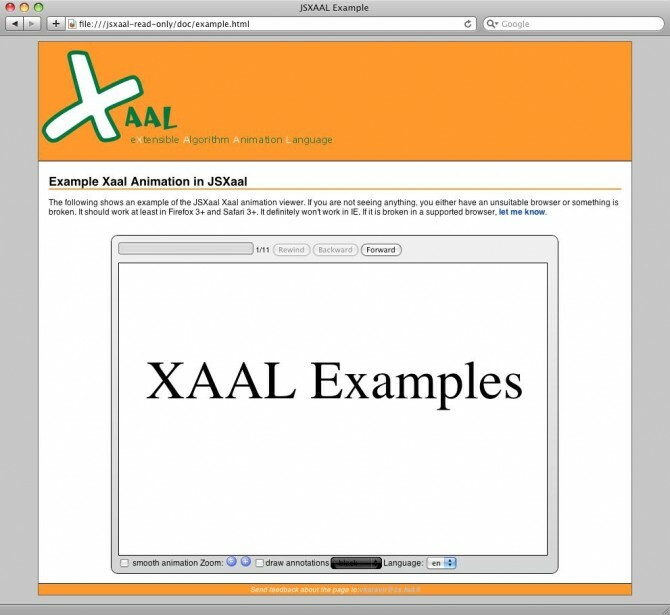 There are also tools for creating and working with XAAL animations. These include a Java parser, classes for creating animations, and adapters for converting XAAL animations for some of the existing algorithm animation systems. These are not, however, published yet but they will be. So, stay tuned for more updates on that! I'll try to post some demos of the viewer soon. Below is a picture explaining the main parts of the viewer. Welcome, I don't know how you ended up on this page, but this is (or will be) my blog. Me being Ville Karavirta. I'll write about algorithm animation, computer science education tools, and post some photographs. At least that's the plan for now, we'll see what it becomes.. Check the front page for information on who I am.